Adobe Captivate Training Montréal - Learn with the best! Captivate makes it easy to build interactive eLearning modules. You will work along with us, step by step, as we demonstrate how to create engaging and informative course material. HD product demos, application simulations, soft-skills and compliance training materials – Captivate does it all. Prerequisite: None, although knowledge of either Powerpoint or Keynote would be helpful. 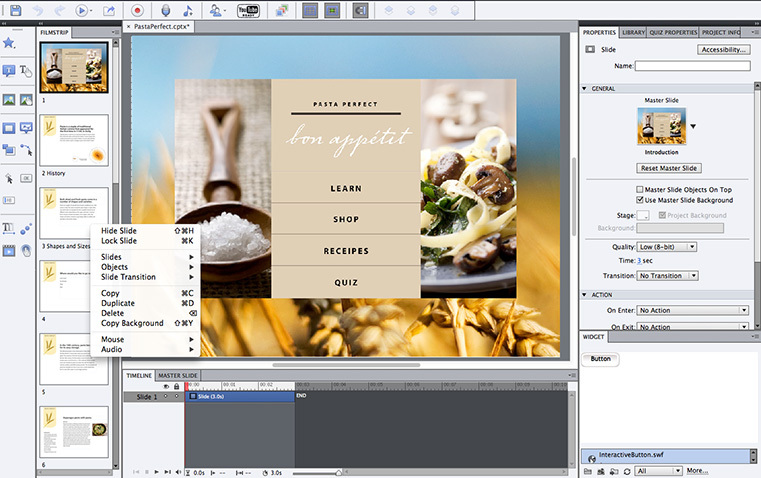 » What’s new in Captivate ? » Cancellations made more than 5 days before the commencement of the training qualify for a full refund less a $75 administration fee. » Cancellations made 5 days or less before the commencement of the training are not eligible for a refund but classes may be rescheduled. » Rescheduling requests made 5 days before the commencement of the training are free. Rescheduling that takes place within 5 days of the commencement of training will incur a $75 administration fee. We do not charge for student substitutions at any time.